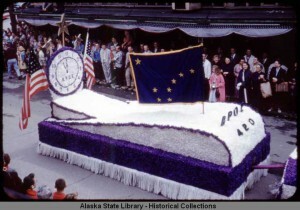 Statehood celebration parade, Juneau, Alaska, July 4, 1959. ASL-P534-38b, Ann Pearson Wood Slide Collection, Alaska State Library-Historical Collections. The Alaska Historical Society offers books and its semi-annual journal, Alaska History, for purchase. There is a 20% discount for AHS members. Shipping and handling is $3 for the first book and $.75 for each additional book ordered. Be sure to include the address to which you would like the volumes sent. Please email members@alaskahistoricalsociety.org with your name, mailing address, and publications you wish to order. An invoice and payment instructions will be emailed to you. Or pay on-line by credit card at our Membership and Giving page by entering the amount due in the Other Amount category.